I won’t give up on you, cotton shirt, no I won’t! After failing to dye this cotton shirt pink with beets last time, I thought of another dyeing method I’ve been dying to try (yes, pun intended). I first saw this Sharpie dyeing idea here, and then I came across another one here. I didn’t have coloured Sharpies though, nor do I have an eyedropper. But I figure I’ll just use my black Sharpies, and a paintbrush would do. The white tunic was made from an extra large men’s t‐shirt. I can’t tell you how I made it though, because it’s kind of free‐formed :S I cut off too much from the sides initially and had to sew on strips of fabric to each side afterwards. It’s not symmetrical at all, but it fits! To get rid of the Sharpie smell I put it in the wash with dark clothing (and socks. We — OK, I — figure they’re old socks so it wouldn’t matter too much, and it’s time Mike gets some new socks anyway), and it didn’t fade! :D Just stained the white areas in a few spots on the same shirt, but it didn’t stain the white socks that we had in the same load of laundry. 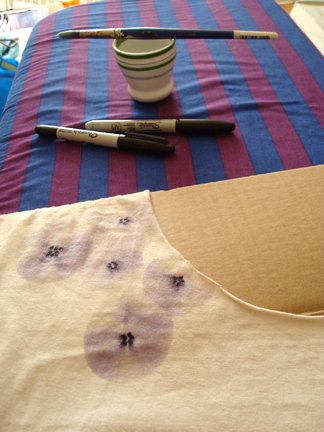 Dyeing with Sharpies is new to me but I later found out that it isn’t such a novelty, there are tons of tutorials and videos on it! Here’s a video on dyeing a scarf with a wavy‐stripe pattern. Very watercolour‐like, which I like. Might have to try that when I get some coloured Sharpies! On a related note, beets didn’t quite work for me but my sister‐in‐law commented that red wine might work, though it would make a ridiculously expensive dye. But then I thought, isn’t wine just fermented grape juice? What about grape juice? Apparently it works well! 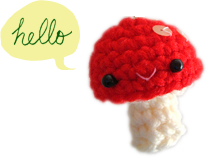 I found this tutorial for t‐shirts here, and for yarn here. Will have to try that too! This dye job looks great! I absolutely love circle designs, and this one in s fabulous. :) They look a little like stylized flowers! What a cool experiment! I guess there’s a tutorial out there for everything, but who knew? It turned out just beautifully, and no one will guess how you did it :-). Wow I love you pattern placement! Please tell how u got this beautiful result! This is the most desirable sharpie tie dye i have seen and would love to create one…or one hundred. thanx for sharing, but give details. thank you, cheryl! i made five or six dots close together in a circular formation, then drop rubbing alcohol directly on top of the dots. the colour will spread on its own into a circle. can’t take credit for this method though, i learned it from the tutorials i’ve linked to in the post. 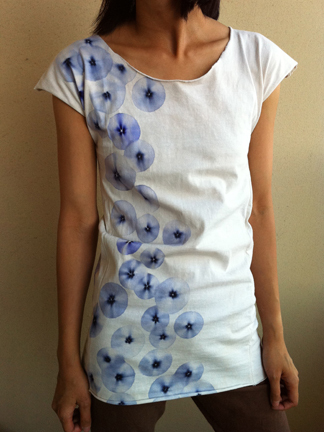 other than that it’s juts the placement of the “tie‐dyed” circles, which is just intuitive. let your creativity flow! hope this helps! Hi! I love this idea! I really want to try it, but I was wondering how you should wash it afterwards? Does the ink run? thanks kayla! the ink didn’t really run, but faded a bit after washing, and my white socks that were in the same wash turned a bit pink. 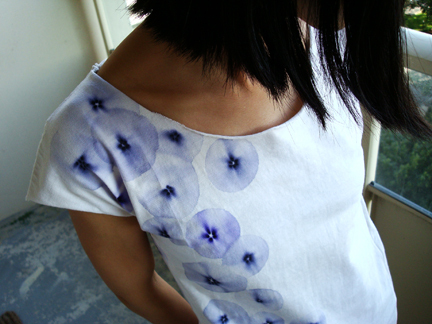 i did also ironed it before washing to try and heat‐set the colour. hope this helps!